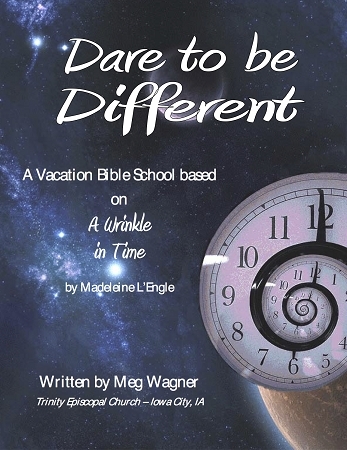 Come on a magical journey with Dare to be Different, using the book A Wrinkle in Time, by beloved Episcopal author Madeleine L'Engle. This children's program uses games, crafts and other adventures to help us learn about our spiritual gifts and how our differences make us special. The story follows Meg Murry (along with her younger brother, Charles Wallace and friend, Calvin O'Keefe) as she embarks on a journey through time and space to save her father. On the journey, we also meet Mrs. Whatsit, Mrs. Which, Mrs. Who, Aunt Beast and other out-of-this-world beings. Lessons help children connect their unique gifts with the community of Christ, and affirms the power of love, courage and self-sacrifice. Dare to be Different is written as a one week, 5 sessions, Vacation Bible School for children ages 5-12 but could be adapted for other uses. For small group activities we split into groups by age. Small groups were the same all week and each group had a staff member.